Thank you McCormick® for sponsoring this Mesquite Pineapple BBQ Chicken post. All opinions are my own. 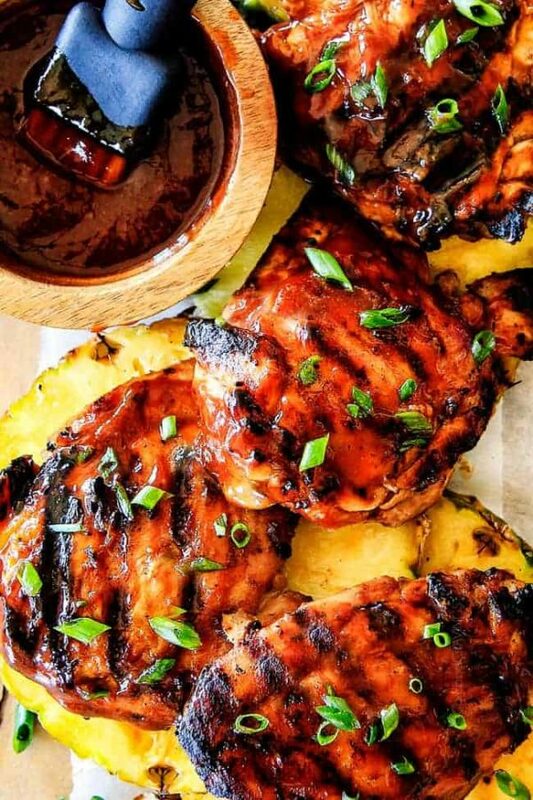 Juicy, smoky, sweet and tangy, Mesquite Pineapple BBQ Chicken smothered in the most wonderful homemade Pineapple BBQ sauce is irresistibly delicious! It’s fabulously easy for a make ahead dinner or Labor Day crowd! Can you guys believe summer is coming to an end? Vacations are ending, school is starting and pumpkin recipes are already inundating my FB feed. But that doesn’t mean that grilling season is over! We grill year-round here in San Diego and September is actually one of our hottest months, so we are going to be firing up the grill more than ever and especially for Labor Day! Do you know what you are making yet? 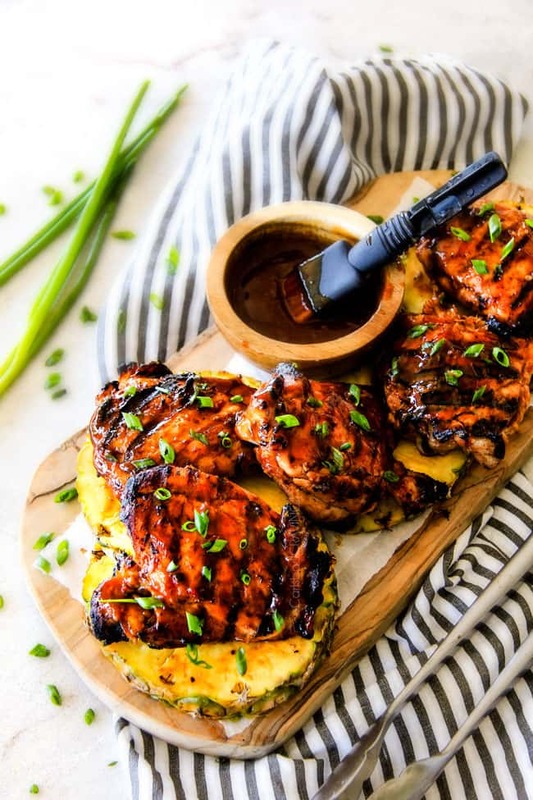 If you’re looking for something rave worthy delicious, make ahead and beautifully simple, this Mesquite Pineapple BBQ Chicken is just the ticket. And nothing says patriotic more than BBQ! But this isn’t just any barbecue chicken, and it’s not just pineapple barbecue chicken but it’s MESQUITE BBQ Pineapple Chicken! 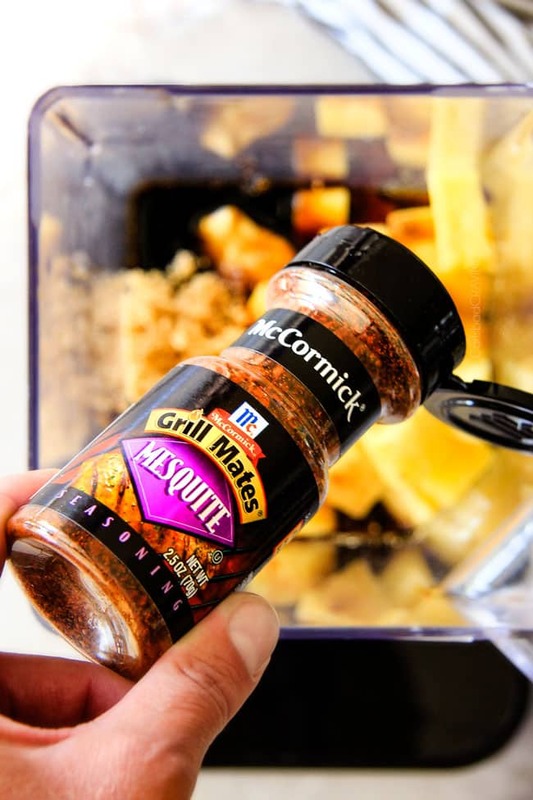 The smoky, robust mesquite flavor comes from McCormick® Grill Mates® Mesquite Seasoning. And it packs a flavor punch. It’s made of chili peppers, garlic, onion, paprika, red bell peppers and of course mesquite smoke for layers of dynamic flavor. It infuses our sweet and tangy pineapple barbecue sauce with the perfect amount of zingy spice. No boring barbecue sauce here! 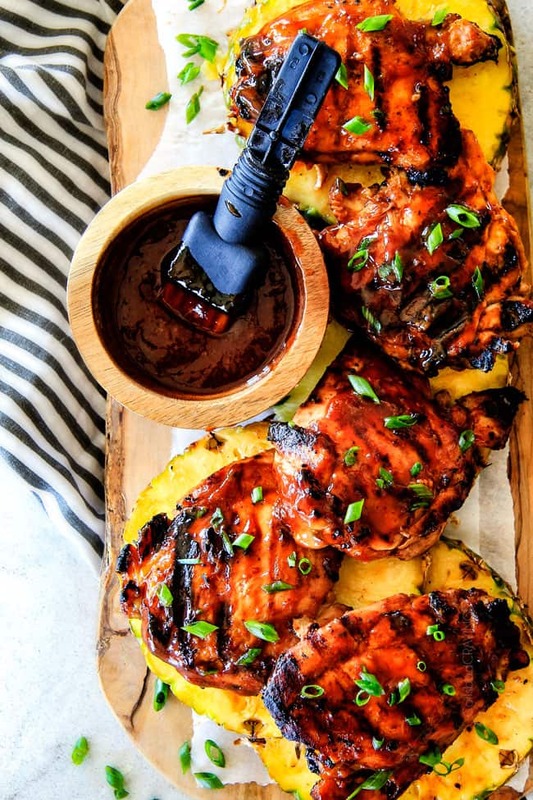 To make our easy Mesquite Pineapple BBQ Chicken, we start with our Mesquite Pineapple BBQ Sauce. You will be amazed at how EASY this homemade BBQ Sauce is! Simply add your roughly chopped pineapple, ketchup, brown sugar, molasses, cider vinegar, Dijon, ground ginger and our McCormick® Mesquite Seasoning to your blender and blend until smooth. That’s it for the sauce! We remove 1/4 cup Mesquite Pineapple BBQ Sauce to a shallow dish/freezer bag along with some olive oil to create a marinade for out chicken. I used skinless, bone-in chicken thighs for extra juicy and wonderfully economical chicken, but feel free to use any cut of chicken you prefer and adjust cooking time accordingly. Just be aware that the leaner the meat, the less juicy the chicken. The chicken swims in the seasoned bath for 2-6 hours so when it’s time to cook – that is ALL you have to do! Well, except slather your chicken in Mesquite Pineapple BBQ Sauce. And when I say slather, I mean smother every nook and cranny. Because we all know the chicken is just a vehicle to devour this BBQ Sauce and call it dinner. 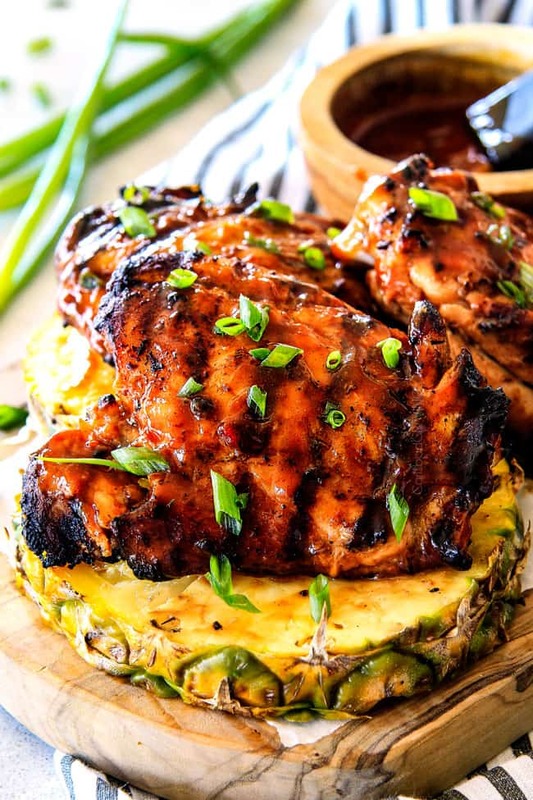 An effortless, juicy, saucy, sweet and tangy Mesquite Pineapple BBQ Chicken dinner. Happy Labor Day and make sure to check out all of McCormick® Grill Mates® marinades and seasonings for a more delicious Labor Day and every day! 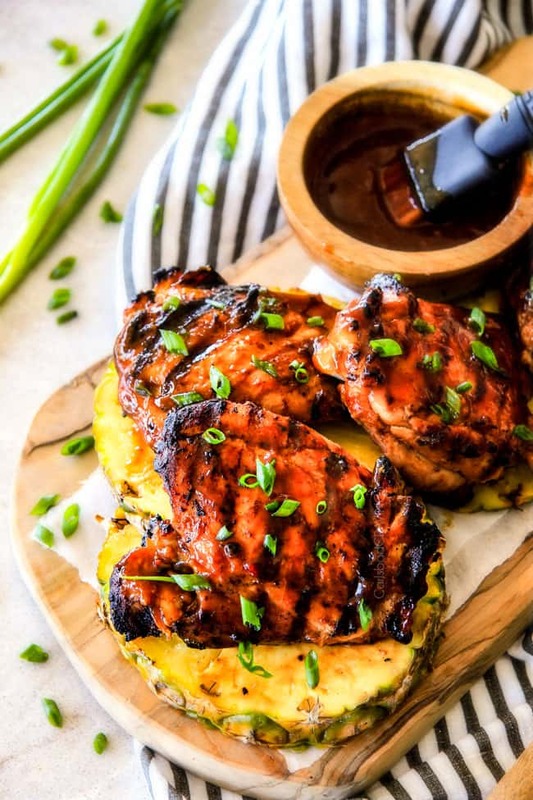 Want to try this Pineapple BBQ Chicken? 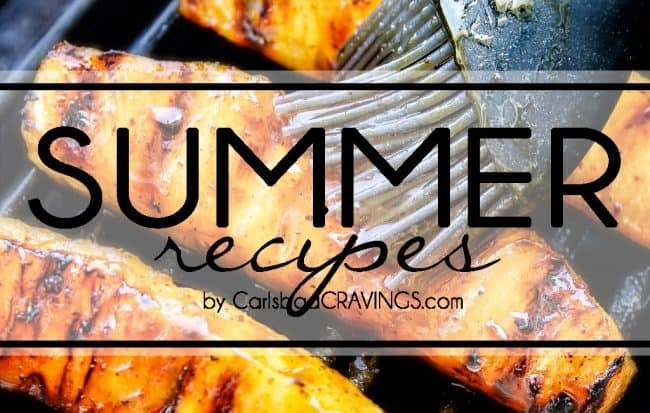 Pin it to your CHICKEN, DINNER or GRILL Board to SAVE for later! 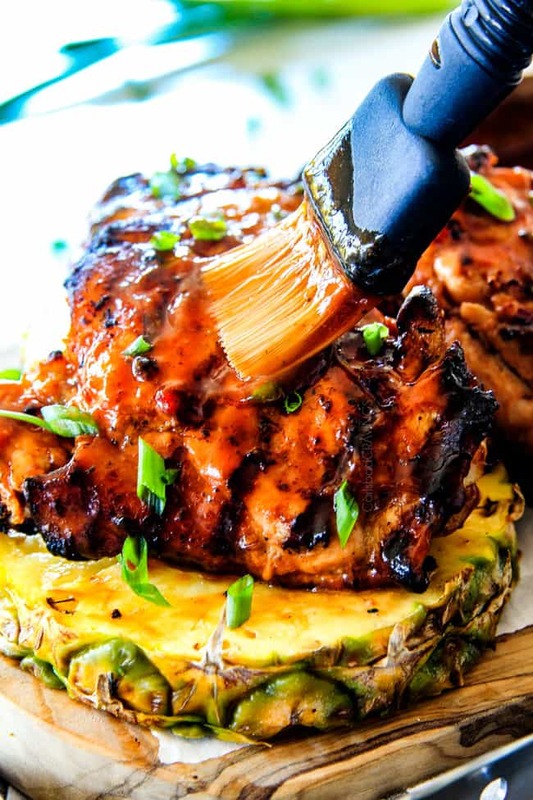 Juicy, smoky, sweet and tangy, Mesquite Pineapple BBQ Chicken smothered in the most wonderful homemade Pineapple BBQ sauce is irresistibly delicious! It's fabulously easy for a make ahead dinner or Labor Day crowd! Add all of the Pineapple BBQ Sauce ingredients to your blender and blend until smooth. Remove 1/4 cup Sauce to freezer bag along with 3 tablespoons olive oil. Add chicken and toss until evenly coated. Refrigerate 2-6 hours. Refrigerate remaining Pineapple BBQ Sauce separately. Heat in microwave/saucepan before serving. Separate out a 1/4 cup Pineapple BBQ Sauce to baste chicken. Set aside. Grease and heat grill to medium heat. Add chicken, and season with freshly cracked salt and pepper. Cover, and cook 6-8 minutes per side, or until no longer pink and an inside thermometer registers 165 degrees F. Baste chicken with reserved 1/4 cup Sauce the last 5 minutes. Slather cooked chicken with Pineapple BBQ Sauce and garnish with green onions if desired. Serve with remaining sauce and additional salt/pepper if desired. Preheat oven to 350 degrees F. Season chicken with freshly cracked salt and pepper. Heat one tablespoon olive oil over medium high heat. Add chicken and sear 2-3 minutes per side. Add chicken to a foil lined, greased 9x13 pan (for easy cleanup), COVER with foil, and bake for 30 minutes. Remove foil cover, baste with 1/4 cup reserved Sauce and continue to cook, uncovered an additional 15-20 minutes OR until an inside thermometer registers 165 degrees F at the thickest part of the chicken. Hi Stephanie, I’m sorry but I don’t understand what you are asking?